Masks and costumes play an important part in superhero (or post-human, as some enterprising writers are beginning to call them) comics. Apart from hiding the obvious identity of the superhero or heroine from others around him/her, these props somehow manage to effect a change in the personality of the individual concerned (even if much of this is sham). Masks, after all, give an individual the freedom to do things he or she would not usually have done. And that goes beyond being true for just superheroes and heroines—it is something that happens in real life. Some of us wear masks some of the time; others wear masks all the time. 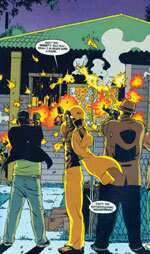 An early 2000s miniseries by Peter Milligan explores this theme. Milligan’s character Christopher Chance is a private detective who takes on the persona of his clients to address situations (threats of extortion, assassination etc.) they face—which is why the series is called Human Target. Chance was created by Len Wein and Carmine Infantino. Wein, better known as the co-creator of Swamp Thing, popularized by Alan Moore in his series of the same name, created Chance in the 1970s, but Milligan’s take on the character is darker and far more complex. And it answers the original question: What if the mask becomes the man? Chance’s impersonation of his clients doesn’t just mean disguising himself as them. He sometimes goes under the knife to look like them. He grills them extensively, and soaks in their memory and experiences. He becomes them. And, sometimes, he forgets who he really is and believes he really is the person he is impersonating. And somewhere in one of the books is an interesting nugget about the real Christopher Chance having retired and this Chance being someone who has taken his persona. In some ways, Milligan’s Human Target books are about identity. In other ways, they are about aspiration—a man without a fixed identity, Chance sometimes craves the mundaneness and normalcy of the identities he takes on. He does fall prey to temptation and usurps the identity of one of his clients, but this story has a violent ending. In this aspect, Milligan’s work is almost a moral, a tale of a fall or betrayal followed by redemption. Milligan’s Human Target books had promise, but for reasons best known to publisher DC, the character featured in just one miniseries. That is something I have come to discover about miniseries (Ed Brubaker’s Sleeper is another such). The promise of what could have been is, usually, more attractive than the reality of what is.